Yamaha 500 series professional flutes combine the brilliance of a nickel silver body with the characteristic warm colors of a sterling silver headjoint. The headjoint, body and footjoint are all heat treated with Yamaha's proprietary acoustic annealing process to provide an impressive evenness of tone and response throughout all registers. 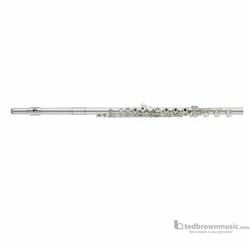 The hand finished sterling silver headjoint is a modified version of the Type A headjoint supplied with Yamaha handmade flutes. The specially designed cut of this headjoint offers incredible response and an impressive dynamic range.The keys feature traditional pointed key arms, reflecting the highest level of craftsmanship and adding visual elegance to these outstanding instruments.